On July 23, 2012, Syria—one of seven nations not to sign the Chemical Weapons Convention—admitted owning a stockpile of chemical and biological weapons. A foreign ministry spokesman warned that Damascus would use these weapons against any force intervening in its civil war. 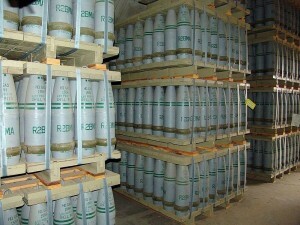 NATO estimates that Syria produces several hundred tons of chemical/biological (chem/bio) agents annually. Since World War I, when chemical weapons were widely used, no nation able to retaliate in kind has been subjected to this type of WMD attack. Chem/bio weapons provide non-nuclear states with a “poor man’s deterrent.” Dr. Jill Dekker, a NATO expert on WMDs, estimates Syria’s arsenal includes chemical weapons (sarin, tabun, VX, and mustard gas) along with biological agents (anthrax, bubonic plague, tularemia, botulinium, smallpox, aflotoxin, cholera, ricin, and camelpox). In addition to a robust air force, Syrian artillery stationed near Golan can hit Haifa and SCUD missiles—with chem/bio warheads—can target all of Israel. Syria possesses 1,000 Russian SS-21 missiles capable of carrying 265-pound warheads to a range of 75 miles. Should chem/bio agents fall into the hands of Hezbollah, Hamas, or al Qaeda, suicide bombers could spread death and destruction on a global scale. The day after Syria revealed its deadly stash, Israeli Foreign Minister Avigdor Liberman declared his country would act “decisively and without hesitation” should Hezbollah or Hamas gain access to these weapons, stating such an act would “constitute an act of war.” Israeli Chief of Staff Lt. Gen. Benny Gantz warned the Knesset’s Foreign Affairs and Defense Committee that Israel must take action “when the time is appropriate,” implying this is a matter of “when” not “if.” President Barack Obama also recently declared any transfer of WMDs to terrorist groups might prompt U.S. intervention. Logically, the “appropriate” time to address this threat is before—not after—terrorists gain control of WMDs. By then, locating and destroying them becomes infinitely more difficult, and there is a much greater risk of casualties among innocents that Hezbollah and Hamas use as cover. For Israel, the threat posed by Syrian WMDs poses a potentially greater and more immediate threat than the yet-to-be realized (but increasingly inevitable) Iranian nuclear threat. Some analysts think Israel may attack Iran’s nuclear-weapons production sites before Americans go to the polls in November based on Israeli speculation that in a second Obama term, without the need for Jewish votes, Jerusalem’s leverage in Washington will be nil. In that case, an Israeli Air Force attack, following conventional operational dynamics, will be at the edge of the IAF’s capabilities—involving 2,000 miles of flying through hostile territory and then fighting its way into and out of well-defended Iranian airspace. Furthermore, the IAF’s bunker-buster bombs are not large enough to penetrate the deeply buried production facilities spread out over a dozen target sites. This adds up to great risks with little long-term benefit. Gideon’s descendants are renowned for military ingenuity. If there are other ways to deny Iran its stated goal of annihilating the Jewish state, Israel will explore them. Furthermore, the Obama administration’s political calculation may well be that since, at present, it can count on 60 to 70 percent of the Jewish vote, which constitutes only 3 percent of the electorate, it may not be worth risking supporters reacting to a doubling of gas prices in the weeks before the election. On the other hand, Syria’s WMDs present an immediate threat but one within easy range of Israel’s air force. While a ground attack might be possible, it risks exposing Israeli troops to chem/bio agents. While aerial attack risks spreading deadly gases, bacteria and viruses, weapons generating extreme heat minimize that danger. There’s one other possibility. Russia could take control of the Syrian arsenal, securing them on its naval base at Tartus. Even though the base is frayed and constitutes little beyond a mooring pier, Israel, NATO, or the United States are unlikely to risk war with Russia. Moscow, however, isn’t inclined to do Washington any favors, although doing so might relieve the Obama administration of doing something that could jeopardize a second term; something Vladimir Putin needs to consider. That’s the way it stands: American foreign policy—and leadership—in the Middle East has devolved to a limited number of risky alternatives, save Moscow’s possible good graces. In this second decade of the 21st century, a growing global-leadership vacuum makes a bipolar future between Beijing and Moscow increasingly likely. The Syrian question becomes, “Is this the world Americans want?” The answer will come in November. Next Article Do Women Still Need Men?